What the heck is a TBvechi, and why do you want them? 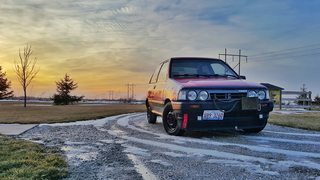 The TBvechi coilovers are a Chinese eBay coilover that offers a lot of advantages over the usual Raceland style strut used in Festiva builds for some time now. We have recently had a great development for the DA chassis from James Bell over at KAInjection: Caster/Camber Plates! These allow full adjustment for the Caster & Camber on the front struts. However, they moved the relative mounting point of the struts further below the strut tower. This reduced the amount of travel in the strut (assuming ride height was kept static). If you were really low, it was borderline unusable. This is where TBvechis come in. They have a much Shorter OAL (OverAll Length) than the Raceland style struts, allowing us to keep all the travel we need while running the CC Plates. TBvechis are also fully threaded! The lower mount is threaded onto the body. 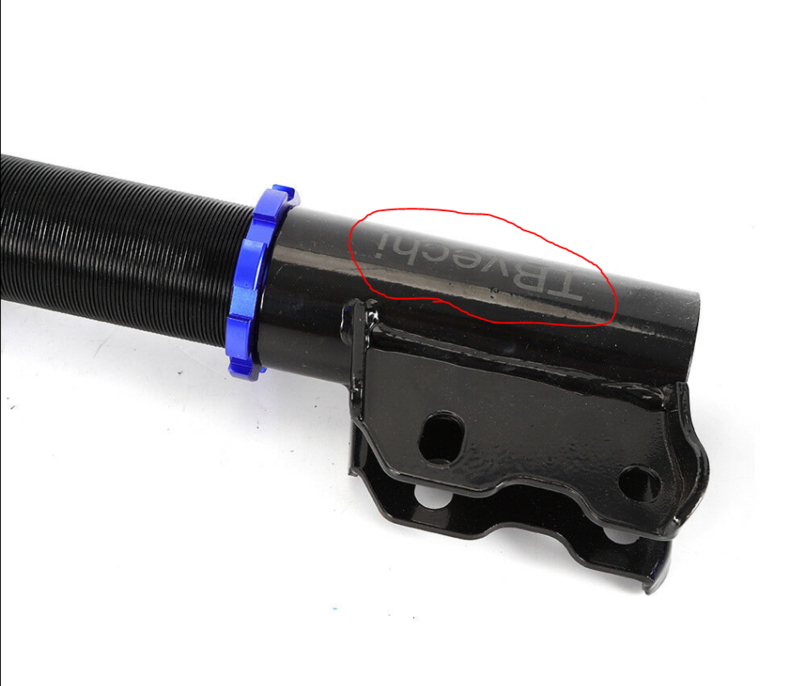 This means your ride height & preload can be adjusted independently from one another. We can also use the relationship between height and preload to really fine-tune the suspension. I'll get more into that later, with the help of Charlie (Advancedynamix), Nate (skeeters_keeper) and others who are much more knowledgeable than I. Until then, I will at least get the shopping list started, so those of us who have ordered CC plates (or those who just want more adjustment / lower cars) can have the parts we need. First, the TBvechis themselves. They are a Chinese company that never actually list their brand on ebay. In order to find them, you must search for keywords, and buy them based on images. The sellers constantly switch around and go out of stock, so I can't post a reliable link sadly. 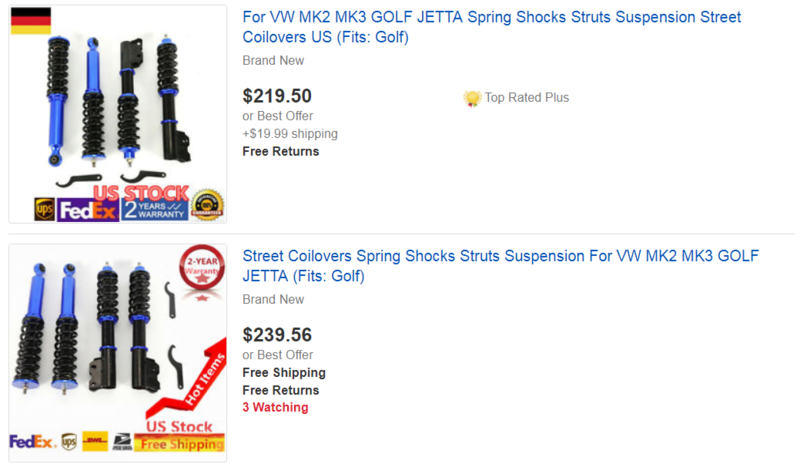 I search ebay for "mk2 golf coilover" , sort by Price Lowest to Highest, then look for the right pictures. They are usually $205 to $250. They have been made in a few different color options, and always with Black bodies. Here are examples so you know what to look for. Note the TBvechi logo visible in the pictures, circled in Red. Once you have those, you will need some slightly shorter springs than the usual guide. 10" long, 2.5" diameter 125# springs from SouthwestSpeed are great for the job. Make sure to order Quantity of 2. 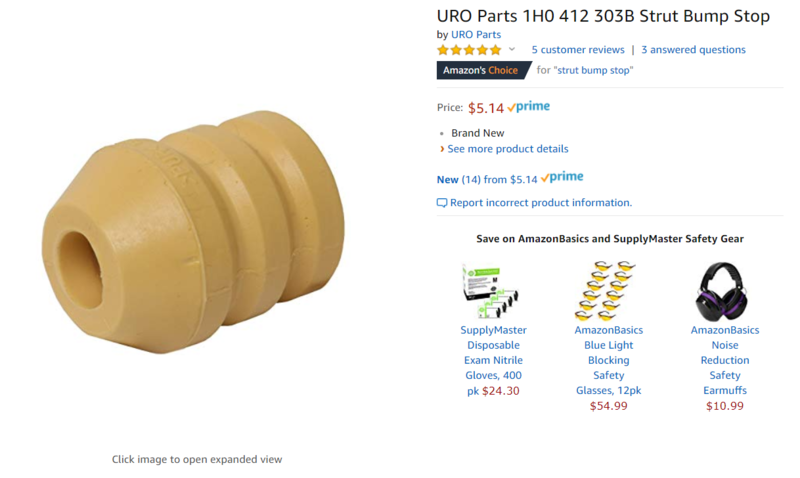 You will also need bumpstops. This is a very important part of the setup, don't skip them! They are less than $6 each. Order 2 of them. That covers the basics for now. I will be adding to this with more information as I have it available. Facebook messenger is the best way. Add yourself to the Member Name Catalog Here! Add yourself to the Festiva Map Here! ​Got a problem with Photobucket image hosting? PM Me!